Already in 2004, Bender was delighted to receive the special Job Motor Award. The object of the Hessen Champion competition is to award companies who distinguish themselves through especially outstanding achievements. This year again, innovative companies in Hesse received an award in the category of World Market Leader, Job Motor and Innovator. 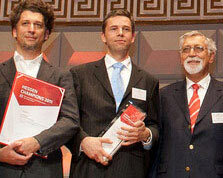 On the evening of the 25th of October 2011, during the Entrepreneur Day of Hesse at Wiesbaden Kurhaus, Dr. Dirk Pieler, D. Christian Bender and Christian Bender were pleased to receive the Hessen Champion Award in the category World Market Leader from Volker Bouffier, the Hessian Minister of Interior. Bender stood out against strong Hessian competitors like Sanofi-Aventis Deutschland GmbH from Frankfurt am Main, Pfeiffer Vacuum Technology AG from Aßlar and VITRONIC Dr.- Ing. Stein Bildverarbeitungssysteme GmbH from Wiesbaden. A jury made up of high-qualified representatives from the media, business and political world praised the company for making the world a more secure place. This year, the Online agency EOL Group from Fernwald-Annerod near Gießen received the award in the Job Motor category. The Innovation Award was handed out to Bode from Kassel. The Hessen Champion Award once again conveyed to Bender, again is a proof and appreciation of the excellent work carried out by Bender employees around the globe.